Alices from past and present for any height Alice may grow to! 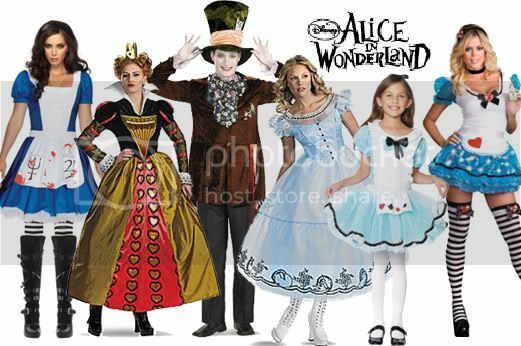 Alice in Wonderland costumes are great for girls, adults or a theme for your Halloween parties and group gatherings. But Wonderland isn’t just for curious Alice. Get your friends together and go as the whole cast of mischievous characters. There the Mad Hatter, The Cheshire Cat, and the outrageous Queen of Hearts. You can also rent costumes for Alice in Wonderland, whether you are just dressing up for Halloween or doing a whole theatrical production. Use you imagination to create whimsical accessories to add the finishing touches to your costumes. You can use old pocket watches, playing cards and tea sets you have about the house. Hurry and order you costumes today. You don’t want to be LATE!